Work has begun over the past week on a site on the Ramparts Road in Dundalk, on which planning permission was granted in 2016 for a mixed use development that includes 65 new homes. The site, located between Marshes Shopping Centre, the former 'Telecom' building and the Ramparts Road, is being developed by Urban Life Developments Ltd.
A planning application was submitted in 2016 for a mixed use development by Camus Developments, that sought to develop two blocks of retail and office units, as well as 28 homes in apartment/duplex form over a further two blocks. It also sought to develop 37 2-2.5 storey houses in terraced and semi-detached format, in a mix of two, three and four bedroom units. 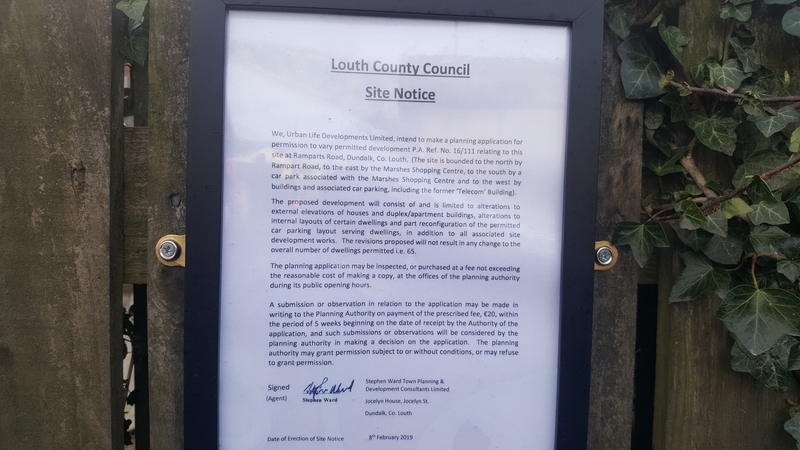 The new developers of the site, Urban Life Developments Ltd., have notified their intention to submit a new planning application to Louth County Council to make alterations to the original application. The changes however will not result in any change to the overall number of dwellings permitted.